Invite health, love, fortune, and abundance with our lucky bamboo plants. Playing an important role Feng shui, each of the variety is easy to care and can be one fascinating present for your dearest ones. An important part of Feng shui, Bamboo plants invite prosperity, abundance, fortune and this is why these pop up pretty much everywhere! In offices, homes, kitchen windowsills, desks, salons, these aesthetically beautify the environment and at the same time send your warm wishes to your closest ones in an evergreen manner. Often gifted as a nurturing token of love, each of these can survive in wide varieties of lights and their inherent easy to maintain quality makes them exclusive and special. Of course, you can venture out and find this tough stalked houseplant, but the real worth will surely come by sending online lucky Bamboo Plant online to your loved ones. Isn't it? And that's when FlowerAura steps in. Brimming with infinite varieties of air purifying indoor plants and luxurious occasion-based gifts, this online gift shop avails bamboo plants online right at your fingertips. In fact, FlowerAura's online gift shop avails to couple your online lucky bamboo with other special tokens such as flowers, greeting card, cakes, a personalized range of gifts, god idols, chocolates, and many more. As a leading florist, FlowerAura makes sure to send your Bamboo plants online anywhere in India to over 200 cities. 1. Two stalks represent love. 2. Three stalks represent Fu (happiness), Lu (wealth), and Soh (long life). 3. Five stalks represent the areas of life that impact wealth. 4. Six stalks represent good luck and wealth. 5. Seven stalks represent good health. 6. Eight stalks represent growth. 7. Nine stalks represent great luck. 8. Ten stalks represent perfection. 9. Twenty-one stalks represent a powerful blessing. A bamboo plant with four stalks is avoided as it conveys death. In fact, you won't find lucky bamboo plants online in India with four stalks. So, if you are looking for Lucky Bamboo Plants Online Shopping, FlowerAura can be your place. Providing so many other flower plants online, the online gift portal lets you buy bamboo plant online in all available varieties. Be it a single layer or a double layer, We've got it all. Each of these can be sent via our same-day delivery that serves to send your houseplant in a matter of no time. So, don't hold yourself any longer, shop your plant and send it anywhere across India. 1. It will easily thrive in a light-filled home. 2. It grows best in bright light. 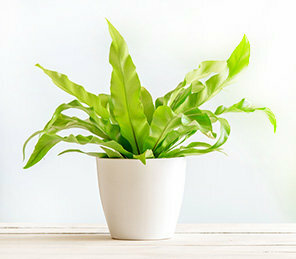 Rotate your plant often so that the light reaches the entire plant evenly. 3. Make sure that the water is always completely covering the roots. 5. Tap water is fine to use unless your tap water is hard. If so, use distilled or purified water. 6. The water level should be just enough to fully submerge the roots but not rise above to the stalks. 7. The plant arrangement in a low dish or bowl should have at least one inch of space between the stalks and the edge of the vessel. 8. If your plant has outgrown the vessel, re-pot quickly! 9. Use a liquid fertilizer in every 3-4 weeks. 10. Your plant should always be green, but if there's a yellow stem, kindly remove the yellow part or the complete yellow stem in order to avoid further deterioration.